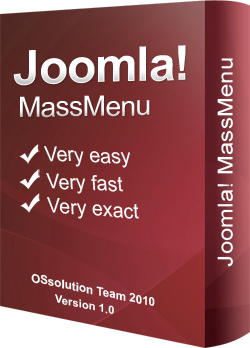 Mass Menu is a Joomla 1.5 native component which allows you to create a huge amount of menu items for articles of your site easily, fast and exactly. If you have a website which has many articles, then you want to have a link for each article. It will be a very bad approach if you go to Joomla Menu Management and create link for each article manually. Suppose that you need to create 1000 links for 1000 articles, this may take you a few weeks to complete. However, with our Mass Menu component, you can complete these works just within some minutes with some clicks. So by using our Mass Menu component, you will save much of your time with absolutely exact result. Once you purchase the Mass Menu component from our site, you will receive the installation package. Then please login to backend of your site, go to Extensions->Install/Uninstall, choose com_massmenu.zip and click on Upload File & Install button to install. Article choosing: In this part, you can choose to add many articles for creating links, you can change order of articles by using Move Up/Move Down button. Menus and Template chossing: In this part, you must choose a menu to assign articles to. Also, you can choose a template to assign created links to that template.